Rising gas prices won’t be keeping over 5,000 gourd art enthusiasts, over half of whom come from out of State, from visiting the Welburn Gourd Farm in Fallbrook, CA for the 15th and Final Gourd Art Festival, being held on Saturday, June 25th and Sunday, June 26th 2011. Many fantastic artists will also make their way across the country to participate in this year’s event. Artists such as Mark and Karen Klay from Tucson, Arizona, Gloria Crane from Hesperia, California, and George Nan from Socorro, New Mexico and 40 others will be exhibiting their incredible work. 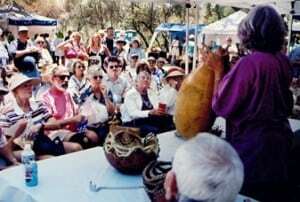 If you are interested in signing up for gourd art classes, you can review the descriptions and photos on the Gourd Art Festival web site at www.GourdFestival.com or by calling the Welburn Gourd Farm at 760-728-4271. Gourds, which were once considered only for making birdhouses and craft items, have now emerged as a popular canvas for fine artwork, some selling for upwards of $25,000, and the Gourd Art Festival is the place where artists showcase their work. For festival admission, adult tickets are $12 at the gate or $9 when you buy in advance on the web site. Children 12 and under are admitted free. General parking is free, and VIP parking is $20 per car. Dogs are not permitted except for handicapped assist animals. To purchase tickets and get more information, visit www.GourdFestival.com or call 760-728-4271.